My wife and I recently began the Mediterranean diet because we want to be more intentional in what we choose to eat. What you eat plays a crucial role in how you are equipped to live. Perhaps this isn’t so different from the path of Christian discipleship. What you ‘eat’ either feeds your walk of faith or leads it to wither and, eventually, starve to death. Paul’s words in 1 Timothy demonstrate both sides of this spectrum. On the one hand, some followers of Christ will consume a diet that consists of “deceitful spirits and [the] teachings of demons.” This junk-food will fail to sustain a life of faith and its consumers will “depart” or fall away from all that is good. On the other hand, those who are fed by the Word of God are equipped to live a lifestyle of godliness “in conduct, in faith, in love, [and] in purity.” Through this healthy diet, God sustains and strengthens His disciples to share the good news of Jesus and to live in a such a way that they invite others to come and see, to hear and to partake. Prayer: Heavenly Father, grant to us a steady diet of Your Word, that we might be equipped to share the good news with every person we meet. Amen. 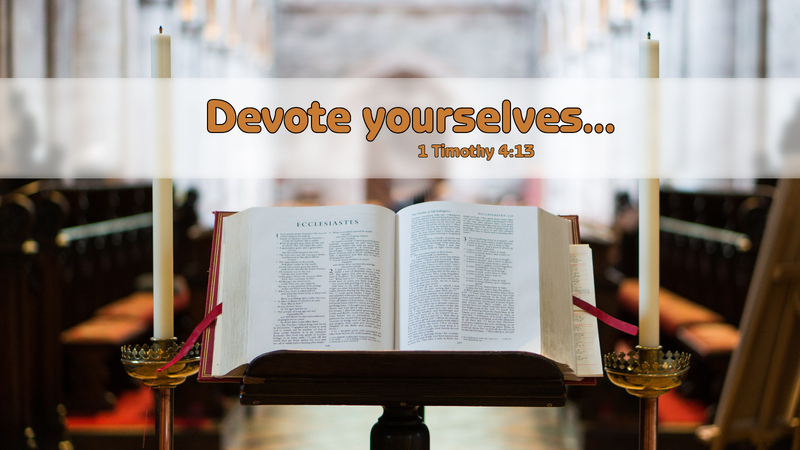 Today’s devotion was written by Randy Drafts, Pastor of Faith Evangelical Lutheran Church, Faith, NC.